I selected the Kenwood radio DNX6980 to install with my Metra dash kit. 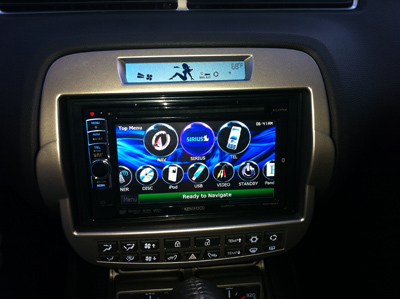 It offers AM/FM Radio, Satellite Radio, optional Backup Camera, Nav System, CD/DVD Player and Bluetooth. The Kenwood allows customization of the colors and I configured the radio button colors to match the Camaro’s light blue interior lighting. 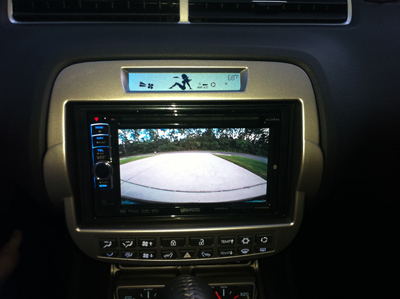 I selected the CM0S-200 backup camera because the color seemed washed out on the more expensive CM0S-300. I didn’t feel comfortable installing all of this myself, so I ordered all of the parts below through a local car audio company. I could have gotten a few of the items a little cheaper, but I wanted the installer to be responsible for everything. This provides a faster resolution in the event an item arrives defective. On a recent trip to Boston, the NAV system froze twice. 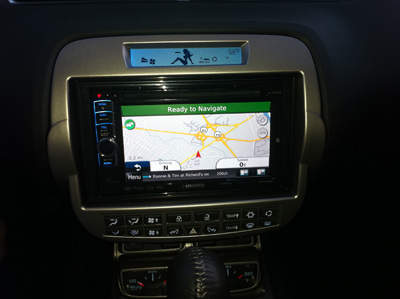 I had to turn off the system and turn it back on to reset the NAV assistance. Changing songs on the iPod via steering controls is sluggish. Sometimes it takes 1-2 seconds and other times it takes 4-5 seconds. It seems like every other change is delayed. The NAV system will randomly leave the normal screen and act like someone touched a part of the map, taking you to a different map format. I have to hit the return button to get back to the normal NAV screen.